Of course, there were so many options for mini foods, so I couldn't just stop at hamburgers and fries. 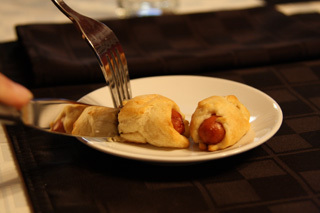 That same night I decided I would also serve mini pigs in a blanket to my guests! So many mini foods, so little time. Then, unwrap the crescent rolls and lay them on a large plate or cookie sheet. Cut each regular-sized triangle into thirds. Open the Lit'l Smokies and place one on each of the small crescent roll triangles. 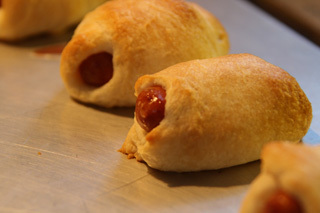 Roll up the Lit'l Smokie inside the crescent roll and place them one inch apart on the cookie sheet. Cook for 8-10 minutes or until the crescent rolls turn golden brown. Use a spatula to remove the pigs in a blanket from the pan. Serve on small dishes (saucers work well) with a shot glass of ketchup. These tasty treats are easy to make and will keep your guests coming back for more!